F-1 visa students hold non-immigrant status and are eligible for entry into the U.S. Students may remain in the U.S. by studying at an approved school and by following the F-1 visa regulations. An F-1 visa is issued by an Embassy or Consulate outside the United States. 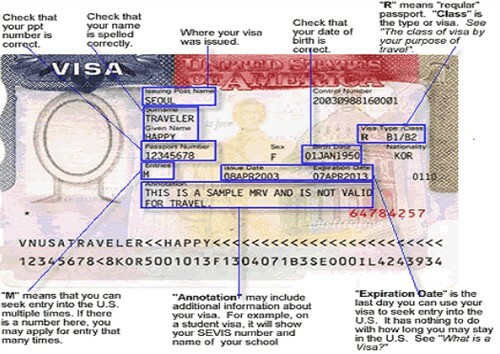 It indicates that you are eligible for entry and reentry to the United States in the category indicated (for example, F-1). Many visas allow for multiple entries and expire on a specific date. Can I get an F-1 visa inside the U.S.? No, it is not possible to apply for or to renew a visa in the United States. Visas are issued only by a U.S. Embassy or Consulate outside the United States. What if my F-1 visa expires while I’m in the US? You may remain in the U.S. legally although the visa has expired. However, you must maintain satisfactory F-1 status (enrolled full time in at least 12 units) each semester. Who is considered an F-2 Visa Holder? In accordance with US Federal Code, the spouse and minor children accompanying an F-1 student are eligible for admission in F-2 visa status. The F-2 dependent may engage in part-time studies at Fullerton College for a maximum of 11 units.